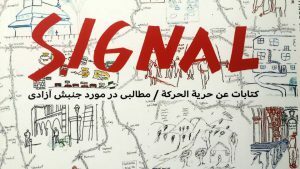 Free Movement Network Tampere warmly invites you to Signal magazine No. 3 publication event! Signal is a multilingual magazine on migration issues, activism, and art. It is available in the event free of charge. You can also find the English texts of the 3rd issue on our webpage. Our event brings together migrants, activists, and the general public. The event will combine poetry, music, movie screening, and a panel discussion on migration eg. deportations and activism against them. The event is free of charge and open to everyone. Families & children welcome! No racism or discrimination of any kind will be tolerated. We will be listening to poems read by migrants and activists – in Arabic, English, and Finnish – on emotions, memories, transitions, transformations, the uncertainty and intensity of diving into the unknown, and prevailing hope for change. There will be an opportunity for the audience to discuss with some of the poets on the poems and themes. In our panel discussion we will hear activists and migrants who were active in the Helsinki Railway Square five-month demonstration during 2017 and in Free Behdad campaign in Tampere during the summer 2018 and are still part of the ongoing work against deportations. The panelists will share with us their experiences, the outcomes and challenges of the campaigns, different approaches to activism, lessons learnt and future plans. The audience will also have the chance to participate in the discussion with the panelists. Discussion is in English, but we organize translation at least in Arabic if needed. We will be screening a short film “My second home” that deals with everyday life in Finland while being racialized as black, experiences of racism, but also solidarity. The filmmaker Imran Adan will be present to give a talk and discuss with the audience. Language of the film is English and Finnihs. In terms of live music, we invite you to enjoy a guitar duo – Sirocco Beat Duo – with Middle-Eastern and Flamenco rhythms. Home-made snacks and non-alcoholic drinks will be available. Both small donations for the cooks and Free Movement Network are welcome so reserve some little cash with you!